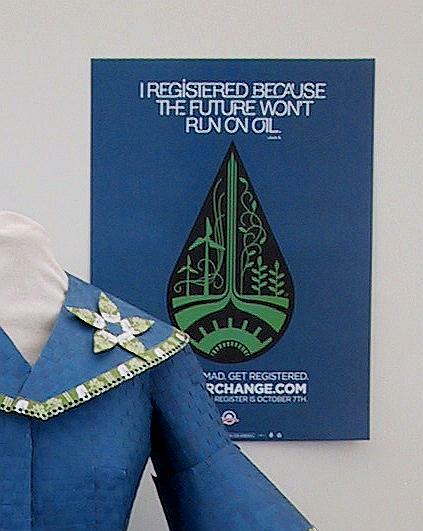 Anne Berkley, my host, asked me if the dress could be partially created in a public workshop prior to the opening. Though I wondered if I would be able to finish the garment before the opening, I agreed. Luckily a wonderful group of about 20 people came to my rescue, and workshop! 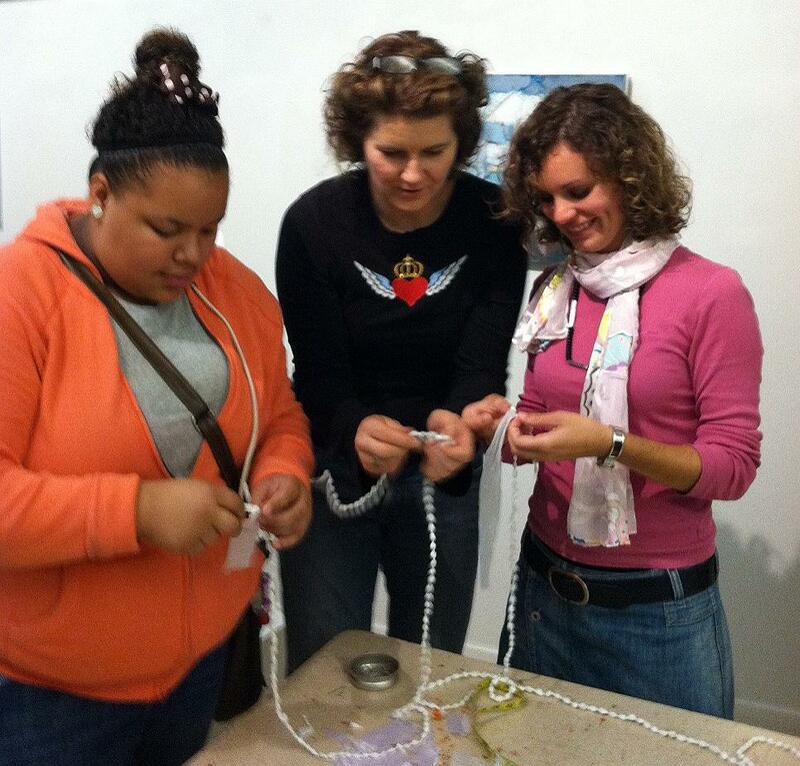 After a presentation on my work, I taught the group how to create “ruffles” from compostable bags, and “fresh-water pearl necklaces” from white plastic grocery bags. I was amazed at how quickly they learned from my harried directions—what a helpful and talented group of women, men and children! 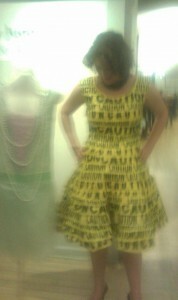 Amazingly, we finished the dress just as the exhibition began! I slipped on my new Caution Dress, created for my TED talk the previous weekend, and enjoyed a lovely evening talking with the talented artists in the show, and the devoted members of the Citizens Greener Evanston committee that organized the event. A little back story to this adventure– when I landed in Chicago, I immediately began thinking about my maternal Grandmother, Mimi, who was a very glamorous and fashionable woman. And while waiting for my luggage, I received an unexpected e-mail from my Mom reminding me that Mimi had grown up in Chicago, and had even lived in Evanston for a while. Evidently in 1920 she attended Northwestern University in Evanston at the age of 15! As a girl she skipped ahead two grades in grammar school. But her parents decided that the University was too big for such a young girl and sent her instead to the Art Institute of Chicago to study interior design. After graduation she received a job at Marshall Fields Department Store designing display windows. On this trip to Evanston, I bega n to wonder if Mimi has been looking out for me all these years. I remembered that it was during my last trip to Chicago 5 years ago that the idea of showing my work in airports came to me like a bolt of lightning. And last week I found out that a prominent museum in Chicago is seriously considering hosting my exhibition of 20 garments after the show leaves the Atlanta Airport next year! I also realized that my love for vintage clothes, which so influences my sense of design, was born from the photos and actual dresses of my glamorous grandmother. 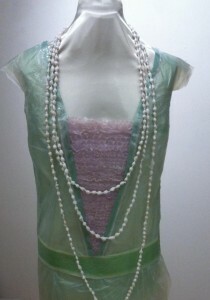 Which brings me back to the flapper dress I made for the Green Arts Show. Where did this inspiration come from? As I thought about the day in my studio in Santa Fe when the image of the flapper dress appeared in my mind’s eye, I wondered if Mimi was with me…inspiring me to create a dress similar to what she must have worn in the 1920s when she was a designer in Chicago! I think you are on to something here. A true example of the heart leading the way and a grandmother standing over your shoulder. Nancy, your writing about your grandmother reminds me of a similar story that occurred when sewing our daughter’s wedding dress from my mother’s wedding dress ( http://hanamele.com/archives/192 ) and a necklace that belonged to my Grandmother Alma. I truly believe my grandmother was there during that time period, joining in our preparation and celebration. We are all so connected in many ways, seen and unseen … why let little issues like death and time get in the way of touching to dear moments with loved ones! Your flapper dress turned out beautiful and thanks for sharing with me, the technique for making “fresh-water pearls” ! Nancy, thanks for the reminder of how important my Grandparent were to me while I was growing. I have a large family. We all lived with-in walking distance or an easy drive from my Grandparents. All of our family activities centered around them and their love.